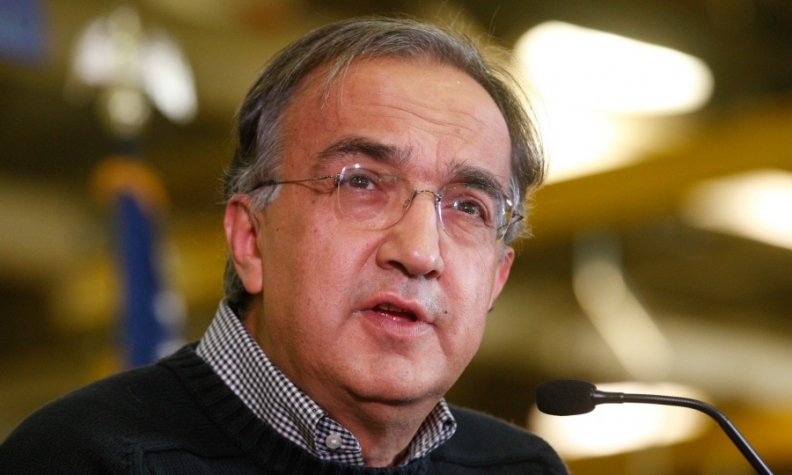 Marchionne is open to Apple alliance. OAKVILLE, Ontario (Reuters) -- Fiat Chrysler CEO Sergio Marchionne said he had visited the heads of Tesla Motors and Apple during a recent trip to California. Marchionne said he had met with Apple CEO Tim Cook and Tesla CEO and founder Elon Musk, among others, on the trip, during which he also rode in Google's self-driving car. "I'm incredibly impressed with what that kid has done," Marchionne said, referring to Musk. Marchionne was speaking on the sidelines of the opening of a Maserati dealership near Toronto on Saturday. Sources have said Apple has been developing its own electric self-driving car. The company has been open about wanting to integrate its core iOS software into autos with a system called CarPlay, which allows drivers to access information on their iPhones without taking their hands off the steering wheel. Various automakers have been looking at potential collaboration with Apple and Google even though they view their efforts to develop electric and self-driving cars as a potential competitive threat. Last month, Marchionne said he is open to an alliance with Apple or Google as he seeks a merger partner for Fiat Chrysler. Turning to Fiat's planned initial public offering of 10 percent of Ferrari, Marchionne said it was on track to happen in the third quarter. He also pledged that Fiat Chrysler would make a stronger entry in the realm of luxury SUVs.